Online ordering menu for Cusato's Pizzeria (RPI). 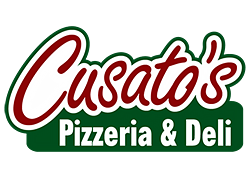 Here at Cusato's Pizzeria we serve wings, pizza, stromboli, and more! Try one of our subs such as the Philly Cheesesteak, Meatball Parmigiana, or the Sausage Parmigiana. We're located by Samaritan Hospital and Robison Field. Order online for carryout!